Does your Atlanta area business have piles of stuff that you regularly hide from your customers? With the help of Patterson Pope — located in nearby Norcross, Georgia — you can have an organized, attractive solution to dealing with that stuff. Our custom high-density shelving systems and other storage solutions will take that cluttered mess and turn it into something you will be proud for anyone to see. 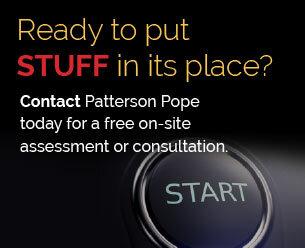 If you think of bulky, unsightly shelving when you think of storage solutions, you haven’t seen a Patterson Pope system. Our mobile shelving and high density storage products in Atlanta are designed to be elegant while also providing a needed solution for dealing with all of the stuff that comes with running a business. When you contact us for help with your high density storage needs in Atlanta, we will combine products like lockers, mobile shelving, carts, automated retrieval systems, cabinets, modular casework and static shelving to create the perfect solution for your Atlanta business. Our high density storage solutions are so versatile that we can easily meet the needs of a wide range of Atlanta area businesses. We have solutions for medical facilities, schools, athletic facilities, military bases and government offices. We also create high density storage systems for museums and libraries, as well as commercial and industrial businesses. In fact, with the versatility of our products, almost every Atlanta area business drowning in stuff can find help with Patterson Pope. Patterson Pope is located in Norcross, which allows us to conveniently offer our storage solutions to businesses throughout the Atlanta area. Just 30 minutes from downtown Atlanta, we are close enough to be quite convenient. Atlanta has a highly diverse economy, and our diverse storage solutions are ready to help. Whether you need a mobile shelving unit, a set of lockers or storage carts, contact Patterson Pope today to discuss your high density storage needs. We are ready to create a custom solution for your storage needs. Our team at Patterson Pope proudly provides mobile shelving and high-density storage solutions to the greater Atlanta area, including Atlanta, Columbus, Augusta, Macon, Savannah, Athens, Sandy Springs, Roswell, Albany, Alpharetta, Marietta, Valdosta and other surrounding regions.